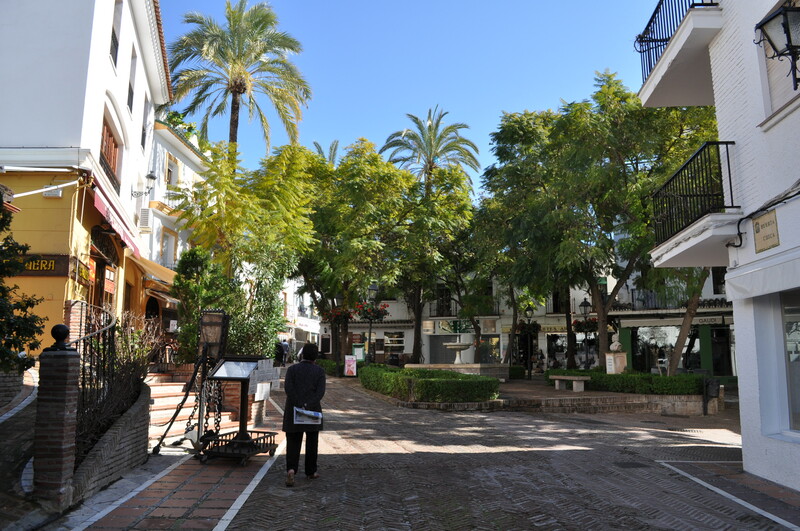 Old Marbella, or ORANGE TREES!! 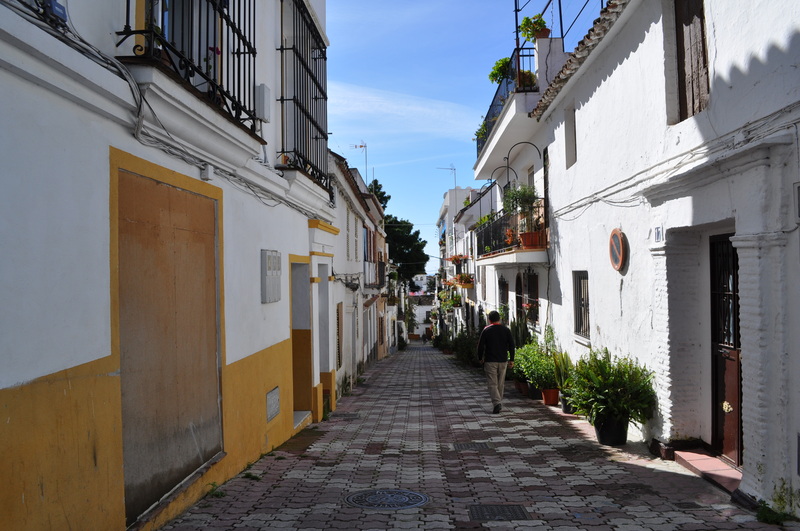 We left for old Marbella at about 10 a.m. It’s a short ten-minute drive west down the Costa del Sol, which is lined by luxury homes and palm trees. We got there early enough to find a good parking place in town, probably because it was a solid four hours before the Spanish like to eat their lunch. Marbella is known now for being an exclusive place. Every guide book and online site I looked at said that the city attracts Europe’s “royals and jet-sets.” And next to each restaurant (note: not taberna or tapas bar) in the books, there are Euros symbols extending off the page. But there was a time when the area was more simple. Once belonging to the Phoenicians, Carthaginians and Romans, it wasn’t really a “playground for the rich and famous” until almost the mid-20th century. 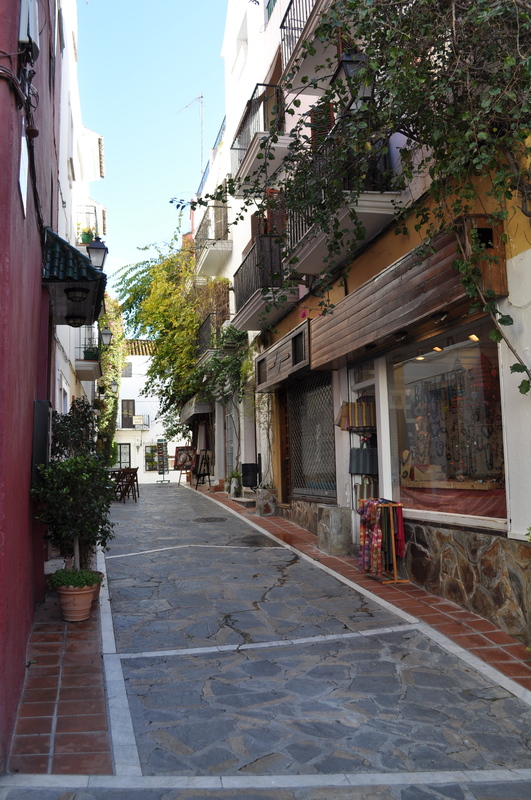 And since we do not fall into ANY of the guidebook catagories for people you might find in Marbella, we decided to go to the old part of town and try to find a little bit of the old, quaint charm. 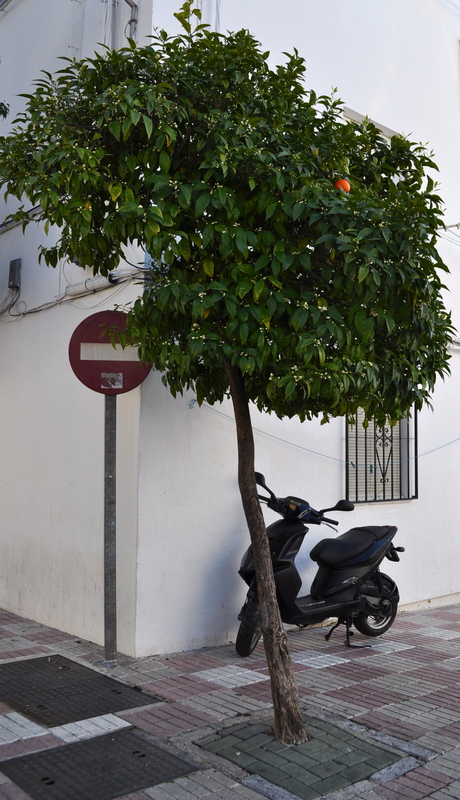 Quiet streets shaded by orange trees. Large open squares flooded with sunshine. The old streets were quaint and charming, and airy. 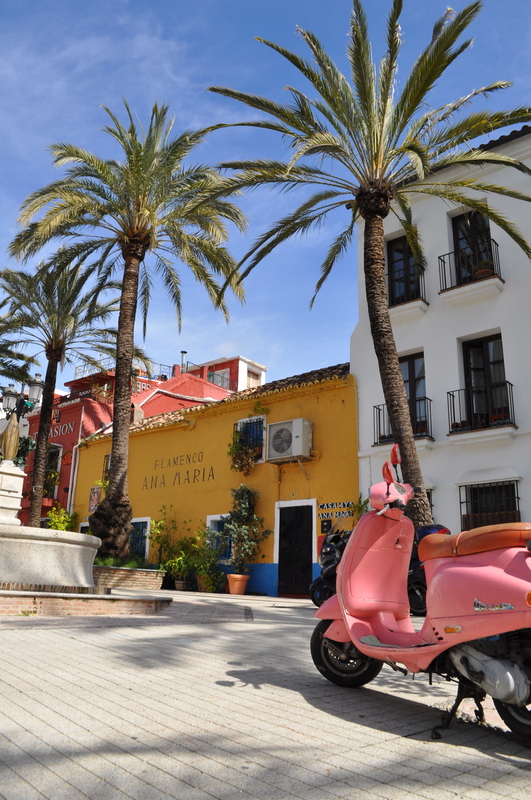 In some ways they are exactly how you expect an old southern Spanish town to look like. I had to pinch myself several times. Moss-lined alleyways, window flowers, and greenery in pots on every single balcony. And of course, because it is Europe, dogs peaking around the corners, old men chatting and enjoying a small beer or wine, and women of all ages gossiping window to window, window to street below. After about twenty minutes (and after accidentally walking through a movie shoot) we made it down to the beach and the long seaside promenade. I call it a promenade instead of a boardwalk because there were too many of Europe’s “jet set” walking around with high heals in the sand and stone wagging Louis Vuitton bags in one hand and two year old children dressed head to toe in more expensive clothes than I will ever have in the other. These aren’t people who are munching fries at Thrashers, if you know what I mean East Coasters! The stroll has been mastered here. It’s okay to go slow and enjoy the sunshine and rolling sounds of the small waves. In the little children’s park on the beach, next to the sand castle architect, I had to laugh out loud when I noticed that regardless of their parents’ income levels or lordships, nothing will stop children from rolling their little Burberry-clad selves into piles of wet sand. It’s just life. 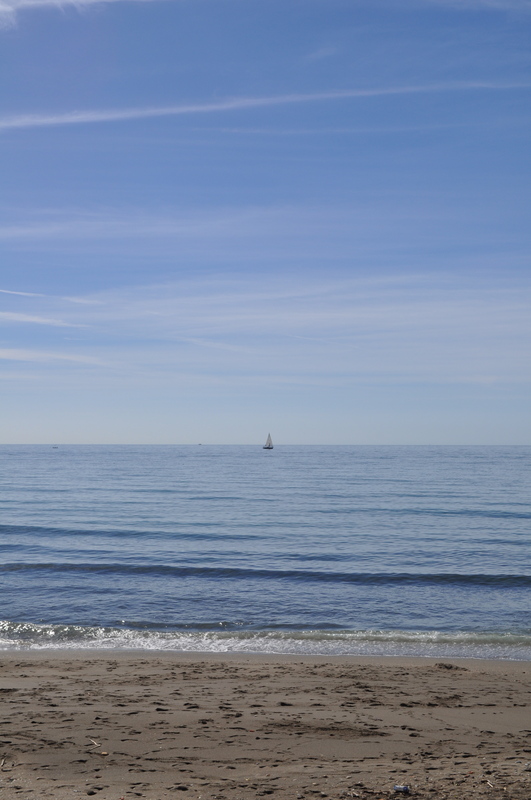 In the distance–one single sailboat. It seemed like everyone was on land, waiting for lunch. 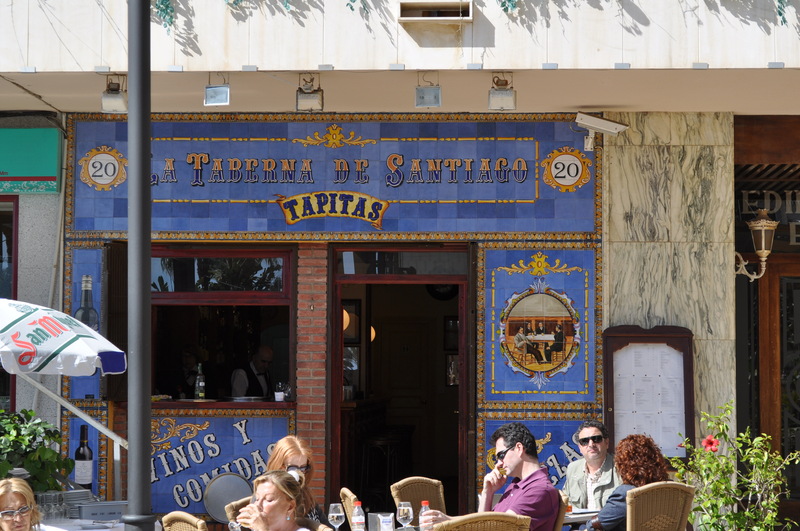 So at about 1, we sat down at La Taberna Santiago tapas bar outside of the park lined by Salvador Dali’s sculptures. We didn’t really have an agenda, so we ordered as we usually do when we don’t really know what’s on the menu—point to a few things and cross our fingers. I had a San Miguel cerveza, which was the type of beer they served at this particular taberna. Gy had a glass of Sangria. 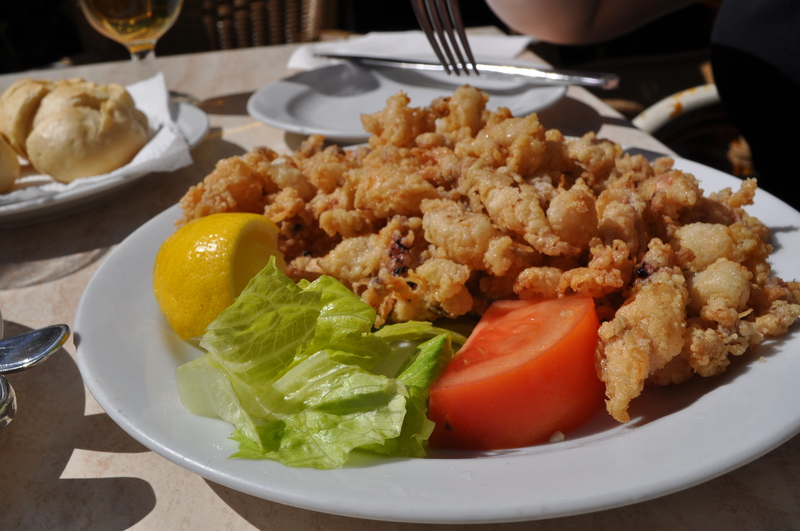 And we ended up with four really delicious items: Fried cuttlefish (in a larger portion for 2), tortilla Espana, a small calamari sandwich, and a small cuttlefish in a sauce, which was nagyon delicious. Everything was delicious. Let me use that word one more time to startle all you English teachers out there who want to underline and write in red TRY A NEW WORD: delicious. Delicious. Delicious. 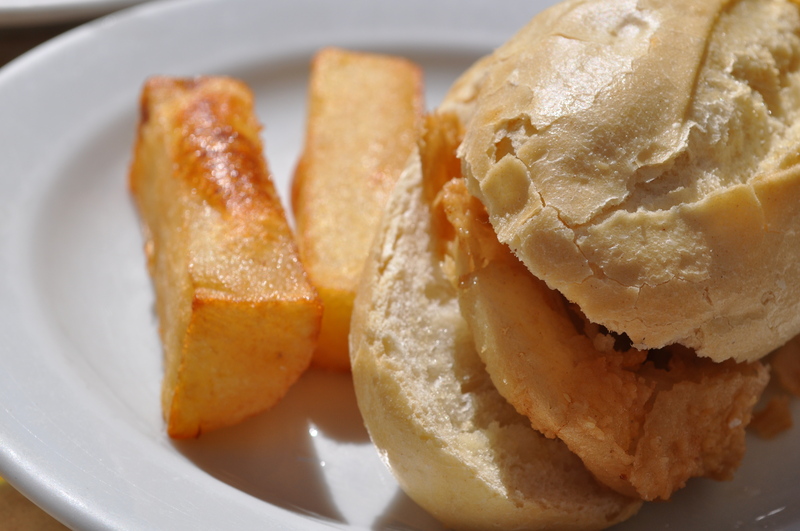 It was the perfect lunch. After lunch, we went back to the Marriott property at about 2 so that we could go to the pool for a few hours to nap and burn. We noticed a constant procession of people down the beach toward a little seaside restaurant, so we decided to get dressed and follow the crowd. 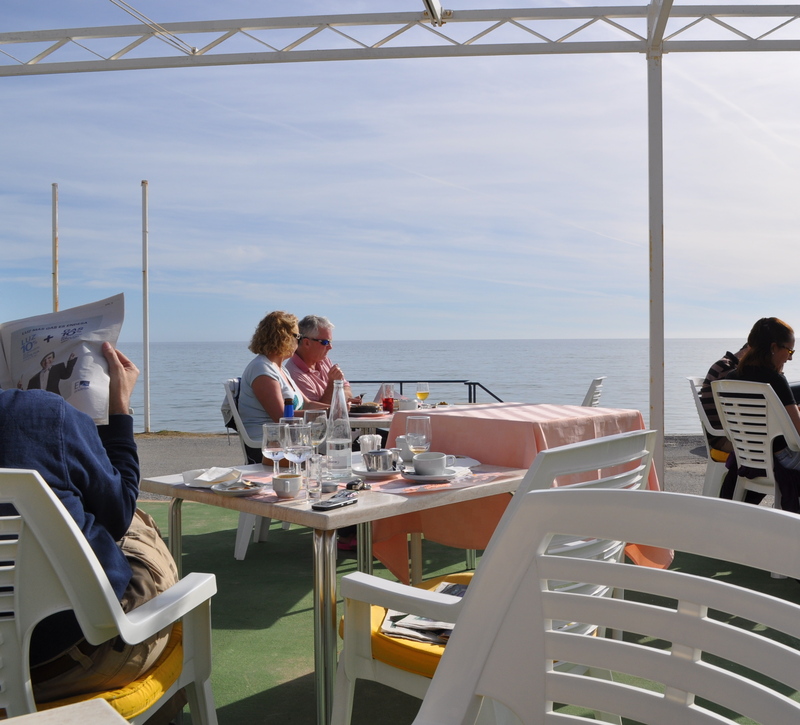 We ended up at a little placed called Merendero Cristina, an ocean-front restaurant, for drinks and dinner. We were lucky that we got there when we did because we secured the last outdoor table. 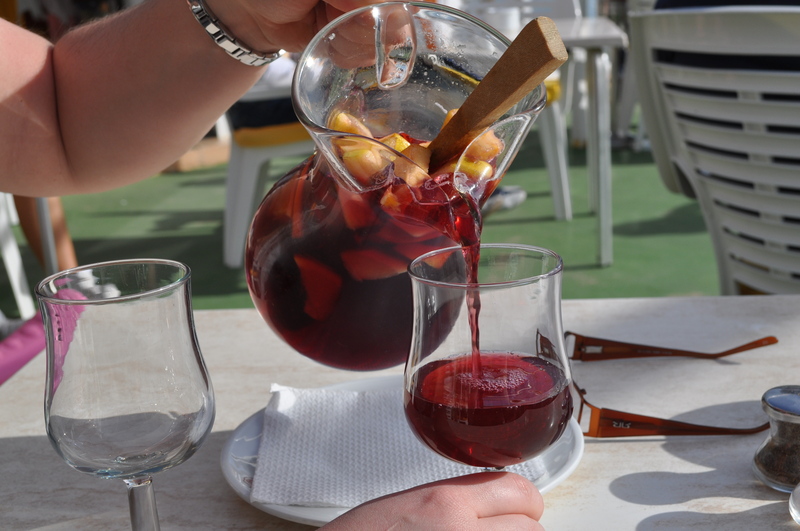 The sun was bright and warm and it was the perfect atmosphere for ordering a lovely pitcher of Sangria. I never really had Sangria before Spain, but it is simple and refreshing. After thirty minutes or so we decided to eat at the restaurant because the air was so nice and we didn’t want to bother looking around anywhere else when we already found the perfect evening location. The sun so so honest and healing. I was bathing in the evening’s warmth. My cousin, Brandy was here last year with some friends. 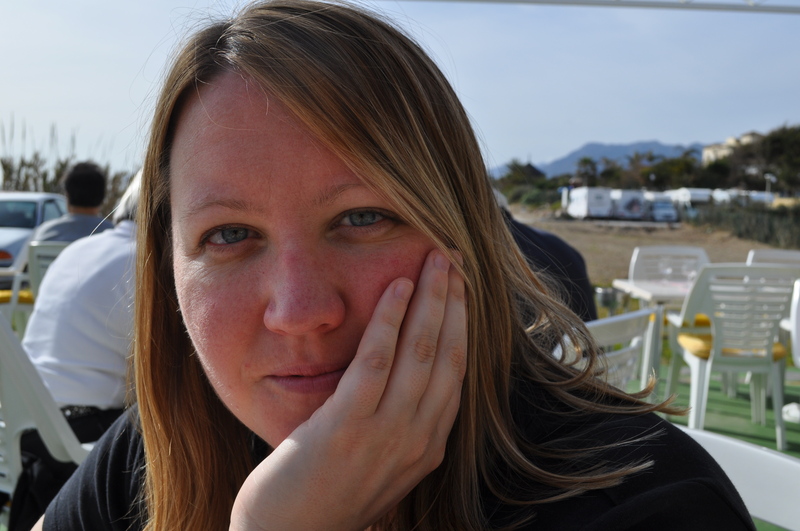 She wrote me a great list of places that we should see etc., and she ended her email like this: Remember – “Yo quiero paella, por favor” means “I want paella please.” Paella is serious in Spain, and especially on the coast…near the seafood. So after a relaxing few drinks, we ordered the paella for two and really loved every bite. 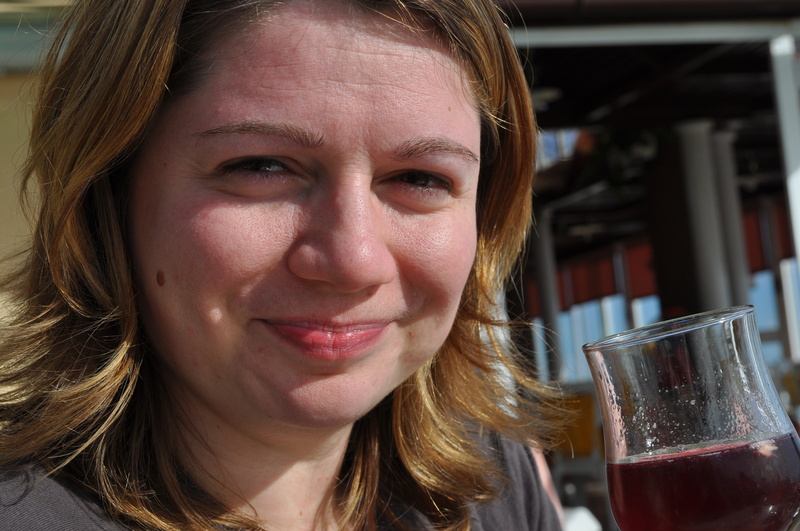 At the restaurant you can only order paella for two or more, so Györgyi had to partake in the meal as well. And even though a year ago she would have told you that she despises “sea creatures”, as she calls them, she loves fresh fish now. Hungary isn’t exactly a mecca for fresh fish, so I don’t blame her delayed arrival to this understanding. I think it was the crab and trout when we were in America this summer, or the rock shrimp in Madrid in January that set the ball rolling. 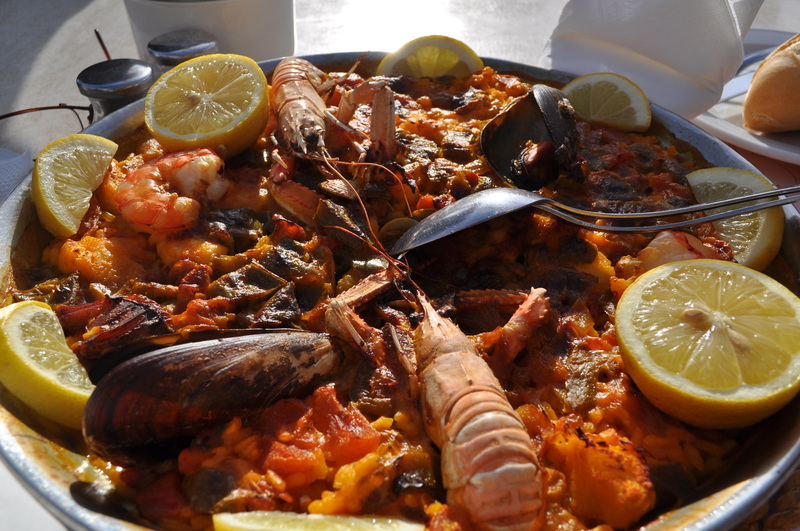 But at the restaurant I basically had to wrestle her for just one shrimp from the paella. She even ate the king prawn with the big, dead eyes staring back at us from the plate. After dinner we walked back to the property to sit out on the balcony and watch the sunset over the ocean. The air got chilly as the sun disappeared, but we didn’t mind it. We haven’t seen this much strong, rejuvenating sunshine in six months. It really was the perfect Spanish day. There’s a chance it might rain or be cloudy the rest of the week, or so warns CNN+. 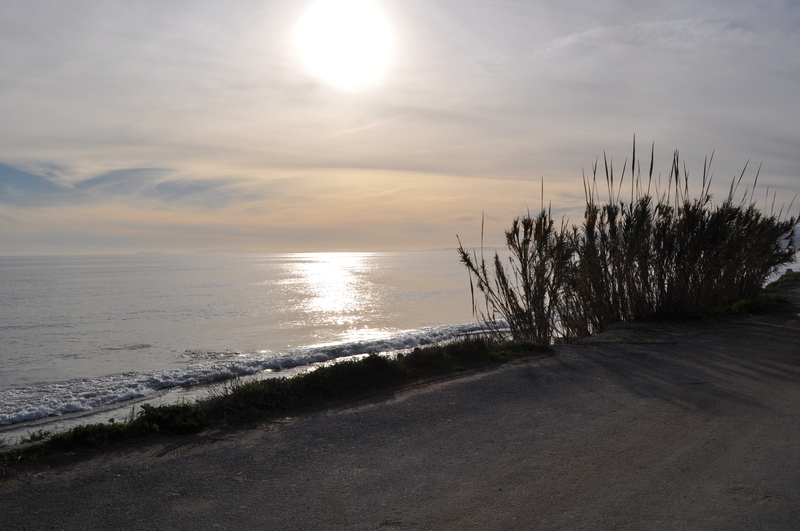 But after this first full day, I don’t think I’ll forget about the sol in the Costa del Sol. It’s cold, dreary and snowy in Pittsburgh. I can’t tell you the last time I’ve seen the sun. I love the fact that your pictures are gorgeous and your words are so descriptive. I kind of feel like I’m there with you (at least in spirit). Keep the pictures coming! Have a wonderful trip. All I can say is WOW! and I am so jealous yet thrilled you are having such a great time in such a breathtaking place. Your pictures are beautiful. Enjoy and certainly eat lots of the creatures from the sea. Stayed three nihgts here . Location was very historical, unique and beautiful. Enjoyed the grounds and the pousada lounge andcommon / public areas which were varied . Restaurant offered tasty dishes as well. One note of caution : watch if you send laundry out ! I was charged extra without my knowledge until closer to my departure. I only wish I was able to make that choice rather than be informed of the extra charge ! Otherwise, rooms are large and comfortable with beautiful views of the river and the Spanish town of Tuy. Good location to use as a base to explore the surrounding areas. Lots of shops available for the tourist as well but watch the prices. Other parts of POrtugal are less expensive for rthe same item !! Friendly and accommodating staff as well. A nice stay.